Gingerbread cookies are a tradition at Christmas time. They make terrific gifts for school parties, hostess gifts and neighbors. So cute all dressed up in royal icing and candy hearts. Molasses is typically used to make the dough but here in Puerto Rico its next to impossible to find Gramma’s Molasses and the Blackstrap Molasses available here in health food stores yields nearly a black cookie rather than a golden brown cookie. Honey makes a terrific substitute as long as you use dark brown sugar which has a higher molasses content than light brown sugar. After making a couple sample batches of dough I’m really pleased with the flavor and color achieved with honey and dark brown sugar…these cookies are just like Mom made way back when. The El Coqui Rincon magazine was kind enough to advertise my cookies for sale in the November issue (check out http://elcoquirincon.com). Each cookie is 4-inches tall, wrapped in a cellophane bag and tied with a red ribbon. Orders are pouring in this week and I expect they’ll continue to come up until Christmas week. The dough is quite soft so to roll it out I use parchment paper dusted very lightly with flour, then dust the top of the dough with a bit more flour and place plastic wrap on top. Once the dough is rolled to about 1/8-inch I remove the plastic wrap, cut the cookies with a floured cutter, remove the excess dough and place the parchment with the cut-out cookies on a cookie sheet. Pop the whole baking sheet of cut-out cookies into the freezer until they are firm. This will prevent the cookies from spreading too much. I got this idea from Laura Vitali’s video and I thought it was so clever. When the oven is up to temperture 350° F. (180° C.) I bake the cookies for 18-20 minutes. Do try this recipe and method. In a medium sized bowl whisk the first 6 ingredients together and reserve. In a large mixing bowl, cream the butter with the dark brown sugar until fluffy, add the honey and egg, beat well. Gradually add the reserved flour mixture to the butter mixture. Scrape the dough onto a large piece of plastic wrap sprinkled with flour and using the plastic wrap shape the dough into a rectangular package. Refrigerate for 2 hours or up to one week. Remove dough from frig when it is quite firm. Preheat oven 350° F. Roll dough 1/8″ thick and cut out gingerbread men using parchment paper as detailed in blog post above. Chill cut-outs 20 minutes before baking. Bake until golden brown, 18 to 20 minutes for my oven but your’s could be only 10 or 12 minutes. Remove baking sheets and let set 5 minutes before removing cookies to a cooling rack. Decorate cookies with royal icing when they are completely cooled. Those little bites of cake on a stick are all the rage these days and what a terrific medium for artistic creation. It’s very similar to making and decorating truffles. This recipe is for my favorite brownie which is super moist and holds together when rolled into balls. You’ll have to forgo the nuts in the batter though and use them on the outside. This brownie is incredibly chocolaty and the chocolate coating is thin enough to not overpower the cake’s flavor. Such a novel idea, brownie on a stick! There are numerous demos available on YouTube with directions for making cake pops from box cake mixes blended with store-bought frosting. There’s also a little cake pop electric iron that makes the balls for you. But, after watching a video (below) on brownie pops I decided this method was the best for me. 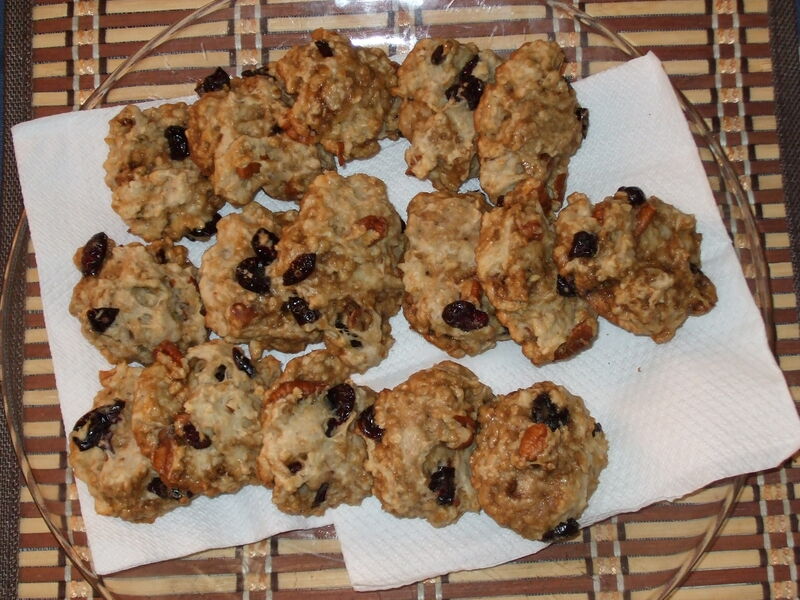 It’s egg-less, dairy free and fat free but oh so yummy with the flavors of molasses, ginger and those sweet prunes. It toasts beautifully and is perfect with just butter. However, this fruit loaf is even more tasty imbibed with brandy and aged like a fruitcake. Light and fluffy yet moist and intensely banana flavored, this cake will steal the show at your next dinner party. The banana pudding filling and whipped cream icing add to the moistness and balance the sweetness. 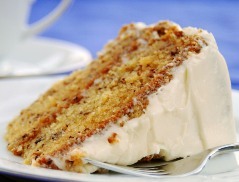 Personally, I can’t think of anything more abhorrent than a powdered sugar icing over a beautiful cake. Give me ganache, whipped cream, creme fraiche, coulis of fruit with liqueur…anything but sickening sweet powdered sugar with fat. Banana Cake was the second best selling dessert at Coco’s, my restaurant in Tonga, surpassed only by my Perfect Chocolate Cake. I made this cake in huge sheets for putu’s (funerals)and pola’s (feasts). Large round layered cakes decorated with fresh flowers and whipped cream were made for birthdays and other celebrations. Polynesians celebrate the 1st birthday and 21st birthday with much fan fare, going to enormous expense to put on a feast for hundreds of people and there is always a representative of the royal family in attendance as well. Young girls dance the Tala’lunga (a traditional dance with hands and facial expressions) at these affairs. Their costumes are elaborate wrap-around sheets of hammered mulberry bark, called tapa cloth, decorated with seeds, leaves and feathers. Guests show their appreciation by slapping paper money onto the dancers’ arms which have been slathered with coconut oil. The money is then given to the royal family as tribute for them coming to the festivities. Odd, in our estimation, that the money is not given to the guest of honor or the hosts. At any rate, there is much ceremony and speeches during the eating of the meal, cutting the cake and distributing the largess. Everyone will enjoy this cake, even without the fan fare. Preheat oven to 350° F. Line 2 baking pans with parchment paper, butter and dust evenly with flour. Add egg yolks, bananas, and vanilla. Mix until well combined. Beat egg whites until soft peaks form. Set aside. Sift flour, soda and salt together. Add to creamed mixture alternately with the yogurt. Note: if weather is very dry, additional yogurt may be needed. Immediately fold egg whites into batter. Pour batter into prepared pans. Bake for 45 minutes or until toothpick comes out clean. Transfer cakes to cooling rack for 5 minutes. Remove cakes from pans and cool completely. Cover top and sides with whipped cream. Use a star tip and piping bag to decorate top and bottom edges if desired. In a heavy bottom sauce pan over medium high heat, place sugar, cornstarch and salt. Slowly add milk whisking constantly until smooth. Temper the eggs with 1/2 cup of hot milk mixture and return to sauce pan. Cook a few minutes more until custard thickens and coats the back of a wooden spoon. Remove from heat. Cool to room temperature. Add banana and lemon juice. Cover top of pudding with plastic wrap and chill in refrigerator. Use to fill between layers of cake. The original recipe for chocolate globs appeared in Maida Heatter’s book of Great Chocolate Desserts, published in 1980. Maida Heatter is a three time winner of the James Beard Award and was inducted into the Chocolateria Magazine’s Hall of Fame. She is known as “The Queen of Desserts” and her specialty is chocolate. Maida’s cream filled chocolate cookies (chocolate globs) was the inspiration for the Chocolate Glob cookies published in the SoHo Charcuterie Cookbook. Sally Schneider, author of The Improvisational Cook, created her recipe for an elegant Essential Chocolate Cake from the chocolate glob recipe in the SoHo Charcuterie Cookbook. Several TV personalities such as Ina Garten and Paula Deen have also developed decadent brownies and yummy chocolate globs based on the recipe from the SoHo Charcuterie Cookbook. The impetus for creating amazing recipes is virtual necessity. The cook starts with an idea, takes stock of the ingredients on-hand and improvises. In baking, this could be substituting almond extract for vanilla extract, using yogurt instead of cream, or adding dried herbs and spices to a chocolate batter. Experimentation or accident can result in dynamic combinations of flavors and textures that awaken taste buds and turn ordinary into extraordinary fare. The recipe given here is based on Ina Garten’s Outrageous Chocolate Brownies, Barefoot Contessa Cookbook, Copyright 1999. 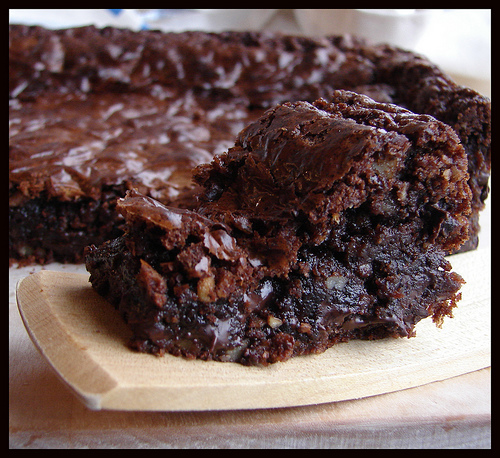 Everyone loves rich moist chocolate gooey brownies. The addition of Kahlua and cayenne pepper give these brownies a little kick. They’re perfect for a piñata party or a coffee break with your favorite espresso or French press brew. Preheat oven to 350 degrees F. Grease and flour a 13 x 18 x 1-1/2 inch sheet pan. Melt together the butter, 1 lb. chocolate chips, and unsweetened chocolate on top of a double boiler. Cool slightly. Stir together the eggs, Kahlua, almond and sugar. Stir in the warm chocolate mixture and cool to room temperature. Stir together 1 cup of the flour, baking powder, salt and cayenne. Add to cooled chocolate mixture. Toss the walnuts and 12 ounces of chocolate chips with 1/4 cup flour to coat. Fold into the chocolate batter. Pour batter into prepared pan. Bake for about 30 minutes, or until tester just comes out clean. Do not over-bake! Cool thoroughly and chill in refrigerate before cutting into squares. 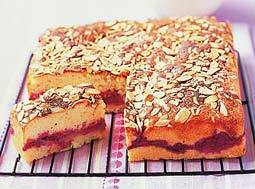 Start your morning with your favorite cup of coffee and this tender, moist cake with a layer of raspberry jam and almonds on top. Preheat oven to 400° F. Grease a 9-inch square baking tin. Mix together Bisquick, sugar, and cinnamon. Reserve 1/2 cup. Mix together egg, yogurt, and milk. Stir wet mix into dry mix just until dry mix is moistened. Pour half the batter into prepared baking tin. Sprinkle half the reserved dry mix over top. This will prevent jam from sinking to bottom of cake. Stir the jam and spoon over top. 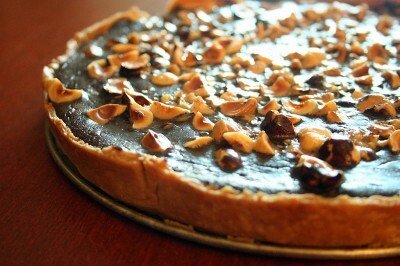 Top with remaining batter, sprinkle with remaining dry mix, top with almonds or nuts of your choice. Bake for 25 minutes or until tester comes out dry. When you need a quick dessert for a summer dinner, try this one using a homemade or store bought pound cake and a jar of homemade or store bought raspberry jam. Start with a puddle of chocolate raspberry sauce, place the pound cake in the puddle, imbibe it with Amaretto liqueur, add a nice big scoop of chocolate pudding made with ricotta cheese, and top it with whipped cream and shaved almonds. You can change the sauce and the liqueur, add your favorite nuts and coconut flakes, or just a dollop of whipped cream to make it your own creation. The whole family will love this one. Spoon 2 – 3 Tbsp of sauce onto individual serving plates. 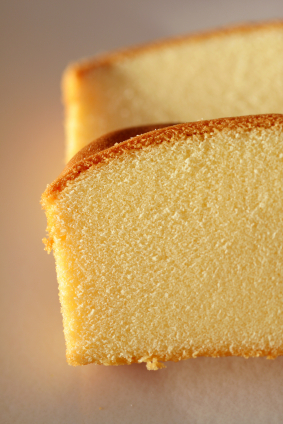 Place 1 slice of pound cake on sauce. Drizzle 1 Tbsp of Amaretto over cake. Top with large spoonful of pudding. This recipe is adapted from the standard Better Homes and Garden Cookbook that I was given for a wedding gift in 1967. I altered the ingredient proportions to make the recipe a “no brainer” for breakfast chefs at my restaurant in Tonga. The secret to making these lofty pancakes is in the whisking – don’t over beat the batter! The batter should be a bit lumpy and then let it rest while the griddle heats up. You can also use a non-stick skillet to bake these cakes. Pancakes should be light and fluffy, and uniformly golden brown on both sides. There’s only 2 tsp of sugar in this recipe because you’re going to serve them with sweet syrup or fruit. At Coco’s, we baked them with sliced bananas, apples and of-course blueberries. Although we paid $8 for 1/3 cup of imported blueberries, blueberry pancakes were still profitable and a good seller. We served them with a variety of tropical fruit syrups or with fruit coulis, fresh sliced fruit and whipped cream. In a bowl, stir together flour, baking powder, sugar, and salt. In a bowl, whisk together milk, water, oil, and eggs. Pour wet mix into dry mix. Whisk to just moisten dry ingredients. Preheat griddle, brush with oil. 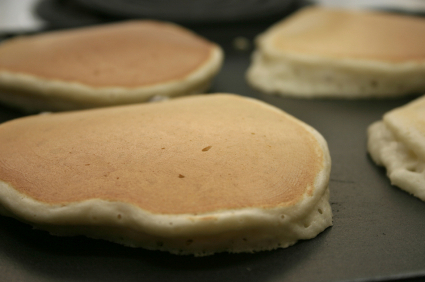 When griddle is hot, wipe off excess oil with paper towels. Pour batter onto griddle and cook until a few bubbles pop and the edges look dry. Flip and continue cooking until done. Lightly press tops, if they spring back, they’re done.